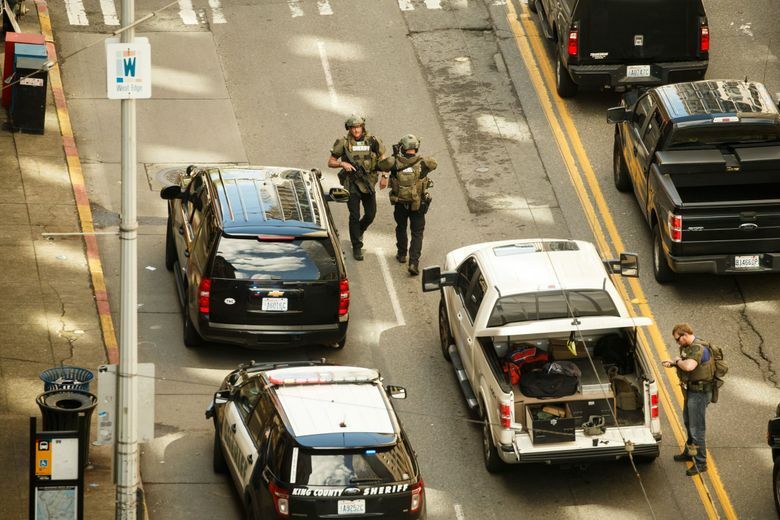 One suspect was killed and two were arrested after the officers were shot and wounded in downtown Seattle. One officer is hospitalized in satisfactory condition, while the other is in serious condition, officials said. 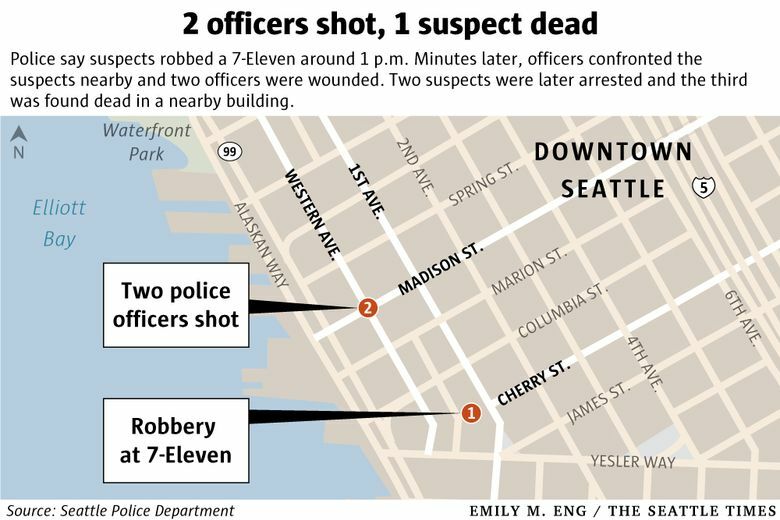 Two Seattle police officers, a male and a female, were shot and wounded in downtown Seattle around 1:25 p.m. Thursday while responding to a robbery at at a downtown 7-Eleven store. Medics took them to Harborview Medical Center. The female officer, age 42, is in satisfactory condition, according to the hospital. The male officer, 30, has been upgraded from critical to serious condition. 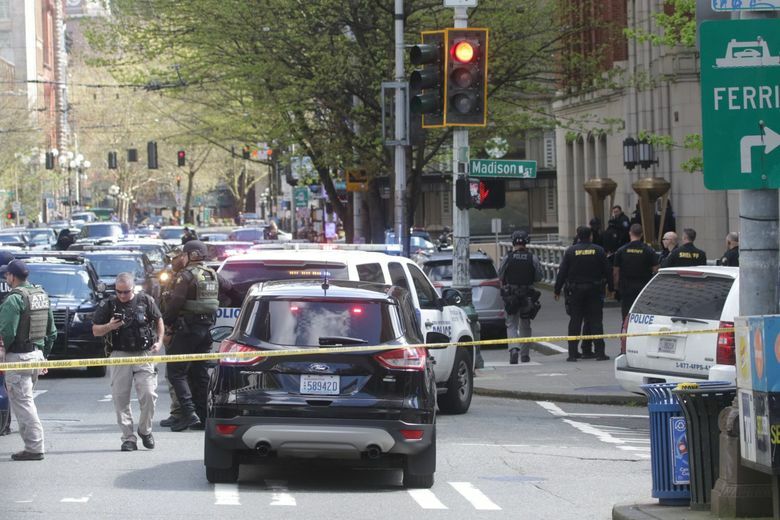 A female robbery suspect was arrested around 2:10 p.m. A second suspect, a male, was later found dead after he barricaded himself in a federal building. About four hours later, police arrested a third person who they believe was involved in the robbery. Police have arrested a third person who they believe was involved in the robbery. No further details, such as the person’s age or gender, were immediately known. 3rd suspect taken into custody shortly after 6pm. Now being interviewed by detectives. Police reported that a third person may have been involved in the robbery. 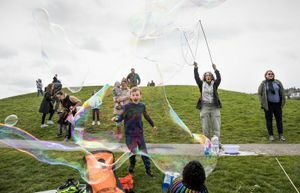 “Case is rapidly developing and detectives are reviewing new evidence as it’s coming in,” police said in a tweet. NEW INFO: Add'l details from arrested suspect have revealed possible involvement of 3rd person in robbery. Detectives investigating. 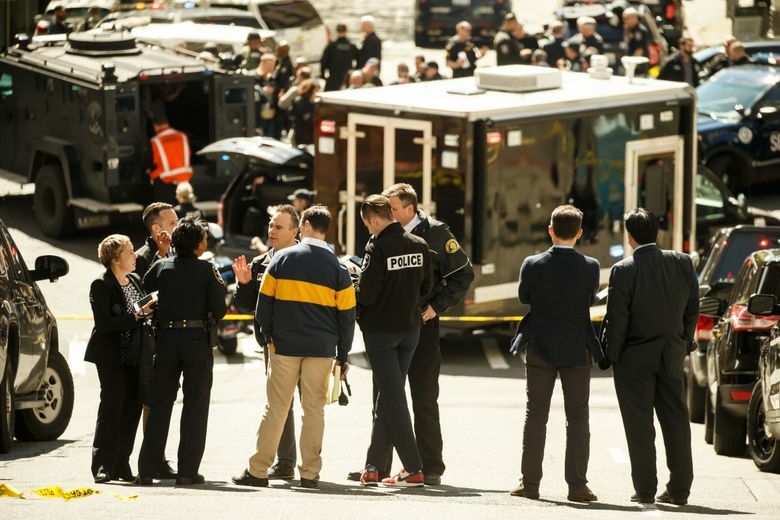 The suspect who opened fire barricaded himself in a nearby building, Deputy Police Chief Carmen Best said. That suspect, a male, was later found dead, she said. 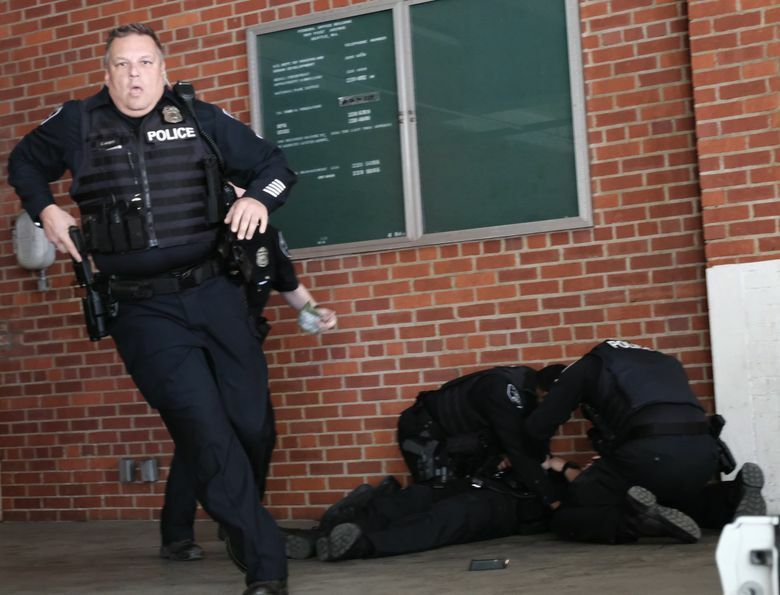 “In an abundance of caution, when we entered the building, we decided to clear it and render it safe,” Best said, explaining why it took so long for police to declare the man dead. No further details on the man or how he died were immediately known. 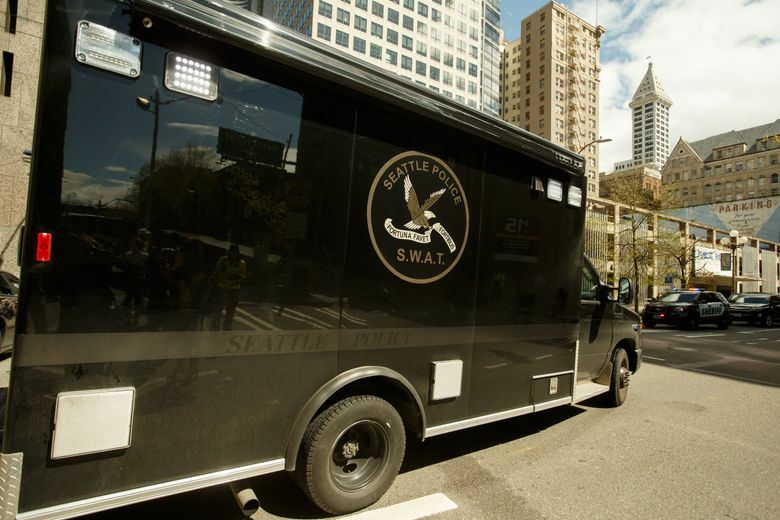 The King County Medical Examiner will formally identify him and determine his manner of death. 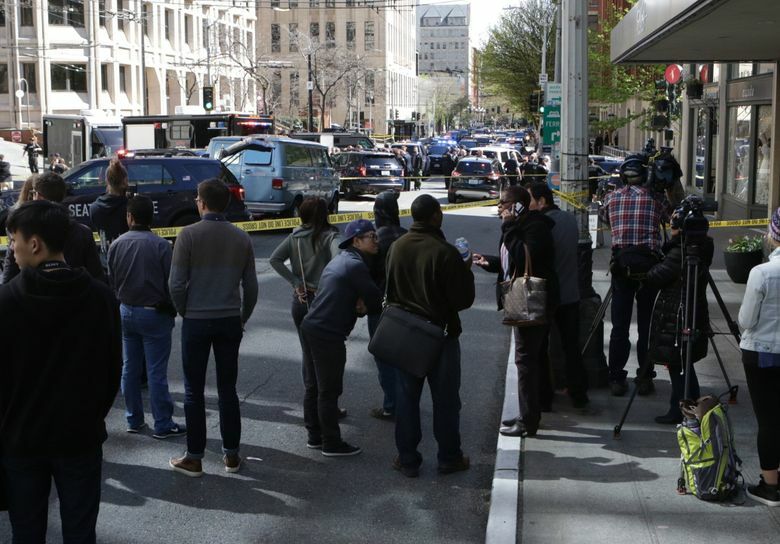 Mayor Ed Murray said he spoke with the wounded officers at Harborview Medical Center. The officers’ names have not been released. 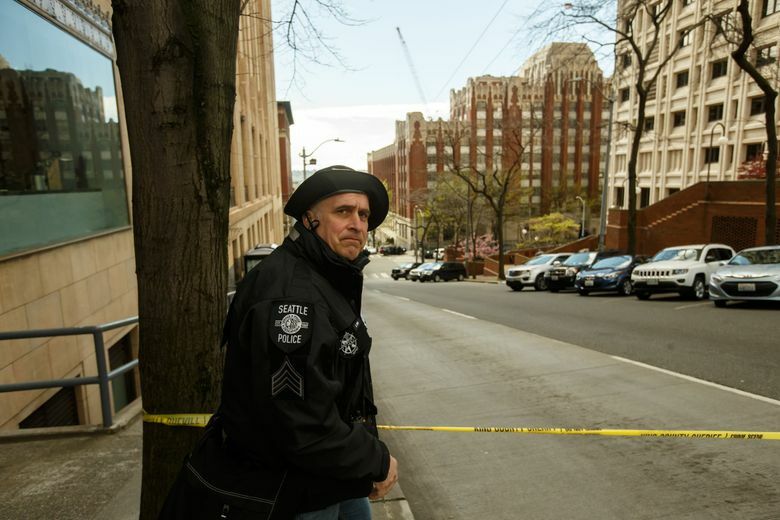 Both have been with the Seattle Police Department for about three years, Best said. The female officer is in satisfactory condition, while the male officer has been upgraded from critical to serious condition. A third officer suffered a minor injury to the finger but it was unclear how it was sustained, police said. 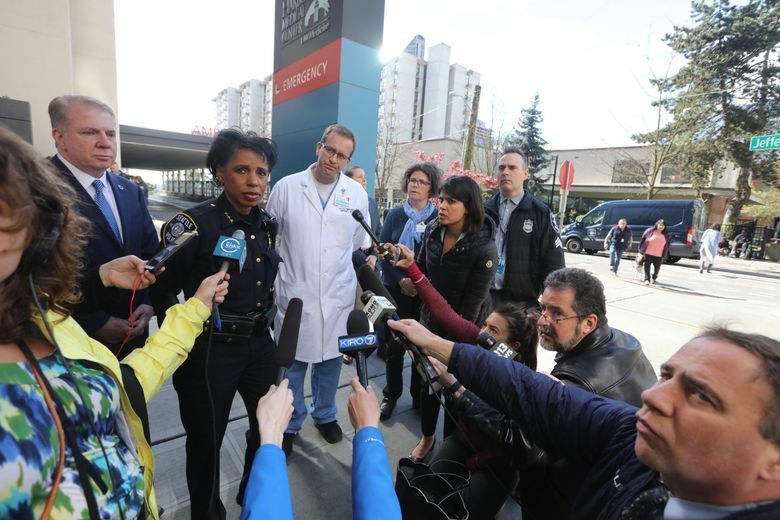 Officials are hosting a news conference at Harborview Medical Center, where the two officers are being treated. 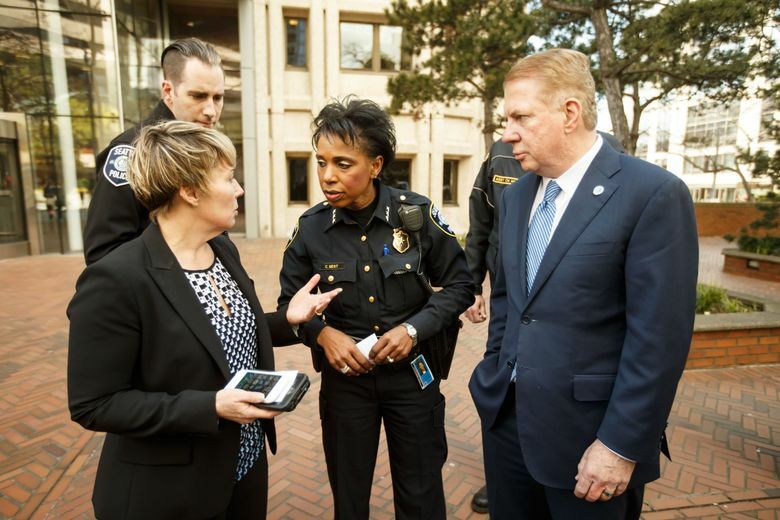 Mayor Ed Murray called the incident a huge tragedy and thanked law-enforcement officers and medics for their swift response. Police initially said there was a third suspect at large, but have since said only two suspects were involved. 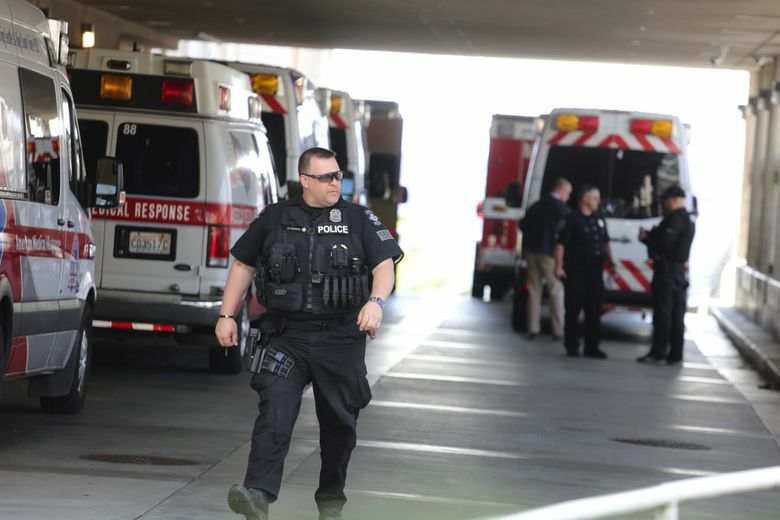 Police and government agencies across the state are expressing condolences for the wounded officers via social media. 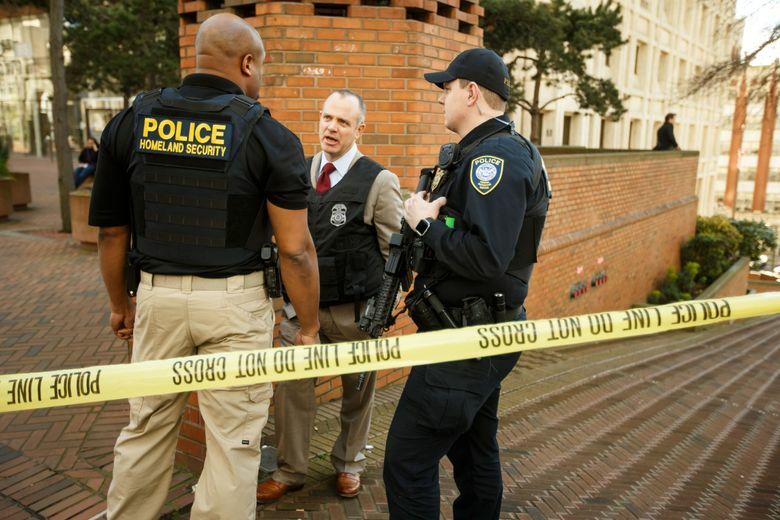 We're sending our thoughts to the officers wounded in today's shooting in Seattle and their families. Hoping for swift recoveries. Mayor Ed Murray and police just arrived to Harborview Medical Center for a news conference. 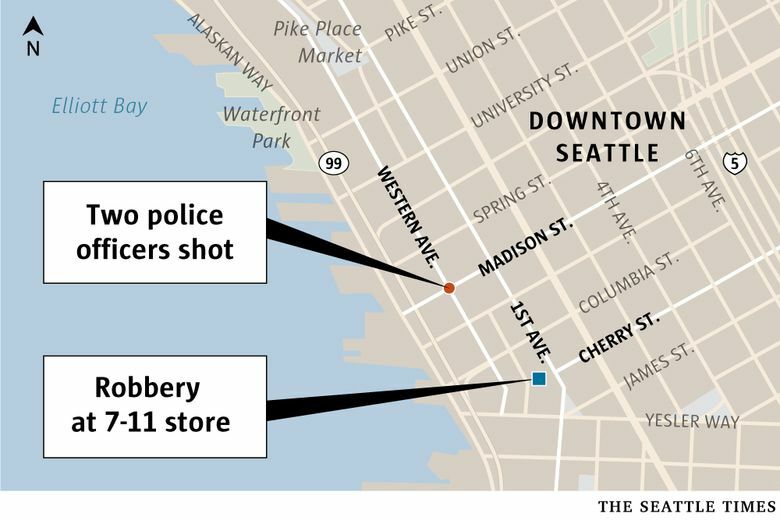 A Seattle Times reporter spoke with a witness, Amanda Clark, who said she saw the suspects in front of the convenience store, a 7-Eleven at First Avenue and Cherry Street. Clark said she was walking to store with her girlfriend when two suspects, a male and female, ran out of the store past her. Then, a clerk chased them out and police apparently arrived a short time later. The officers confronted the suspects about a block away from the convenience store and a fight ensued, Best said. 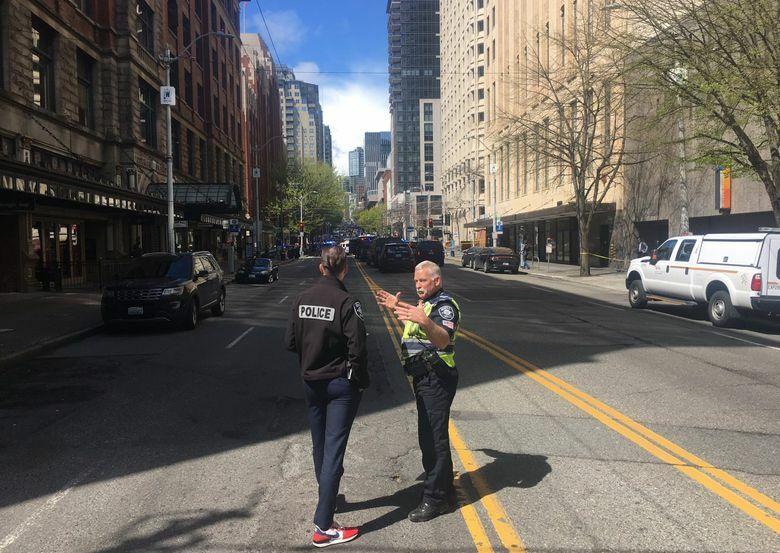 While one officer fought with a male suspect on the ground, a female suspect struck the officer over the head with a bottle, according to Deputy Police Chief Carmen Best. 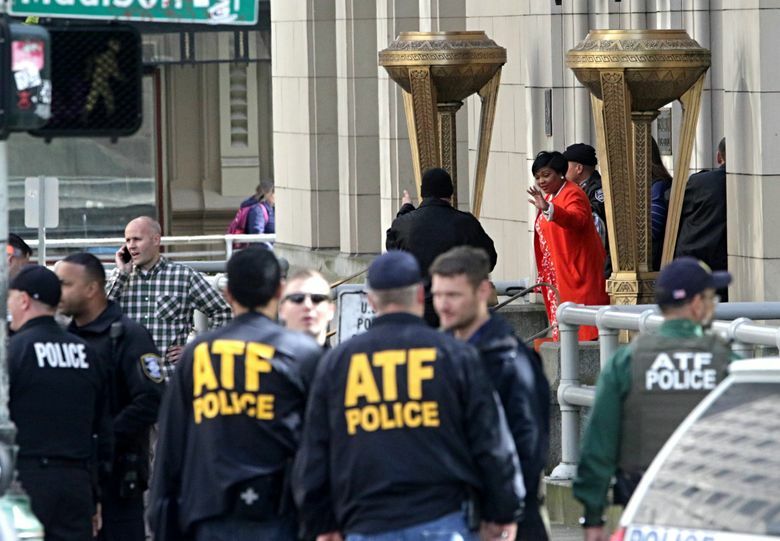 The suspects then fled, and one fired at police, who returned fire, she said. The female officer, age 42, was shot in the chest, but the bullet was stopped by her Kevlar vest. The male officer, 30, was shot in the chin and the rib cage, according to Best. The female officer is in satisfactory condition, according to Harborview Medical Center. The male officer is in critical condition. City officials are hosting a news conference near the shooting investigation. 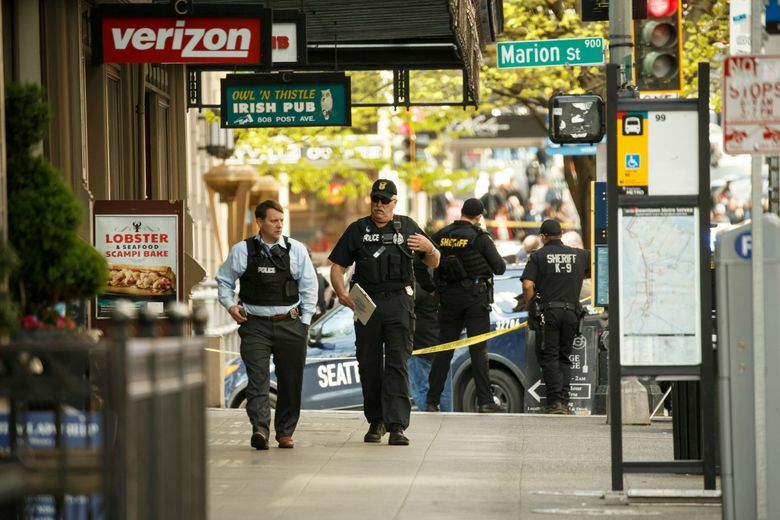 “This is still an active crime scene,” Mayor Ed Murray said. One is male and the other is female. Medics have taken them to Harborview Medical Center for treatment. Also, now police say a second suspect suffered what are described as “significant injuries” and are seeking a third suspect. 1 male officer/1 female officer taken to HMC for treatment. 1 susp detained near 1/Madison. 2nd susp found w significant injuries. 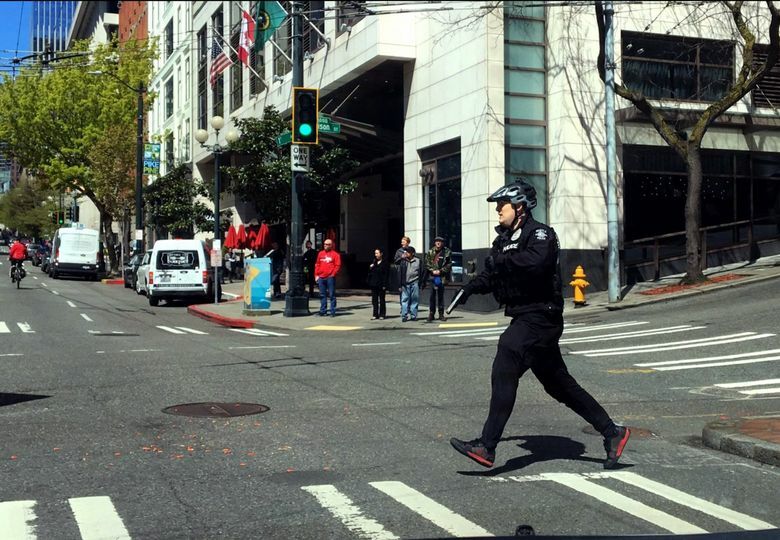 Police searching for possible 3rd suspect: black male, dark complexion, 5'11, 250 lbs, black jacket, glasses, Seahawks beanie. Transportation officials are urging people to avoid the downtown area and warning commuters of delays. 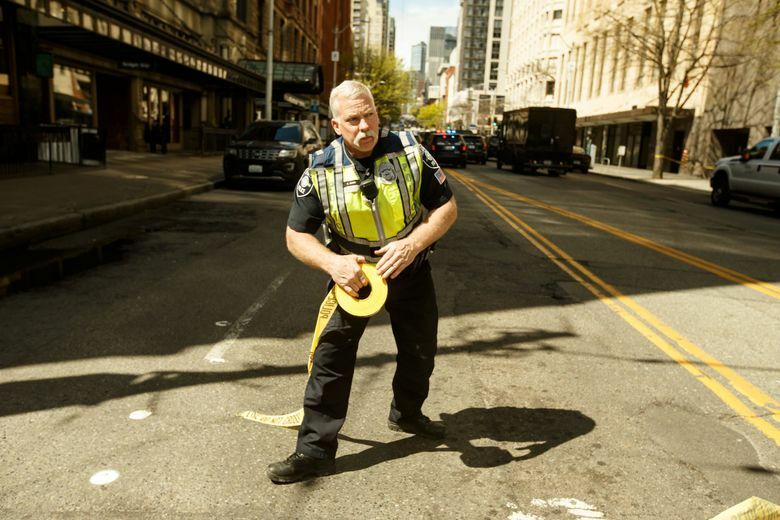 Follow @kcmetrobus, @seattledot and @SeattlePD on Twitter for live traffic updates. 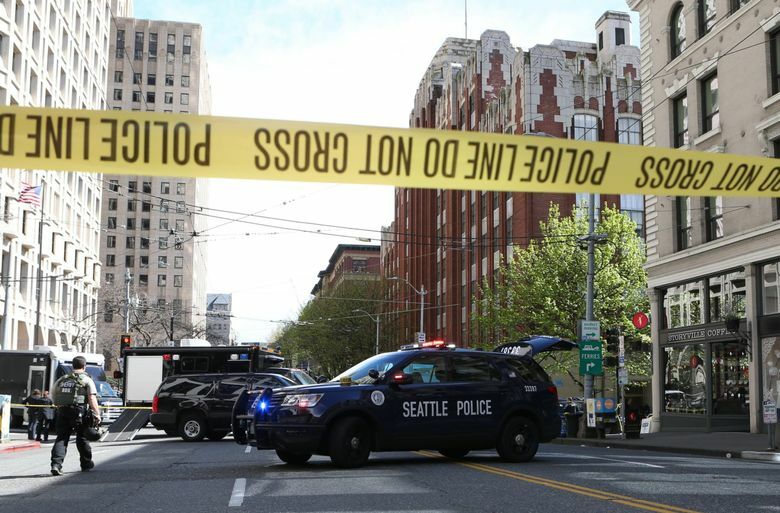 Police have arrested a person who they believe was involved in the incident, according to Seattle Police Chief Kathleen O’Toole. 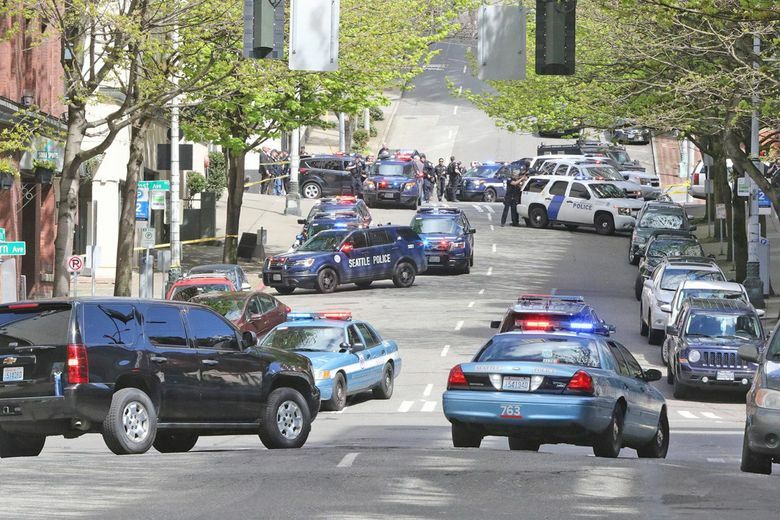 We've just learned that the two SPD Officers injured are both alert and ok. Our thoughts and prayers are with them and their families. 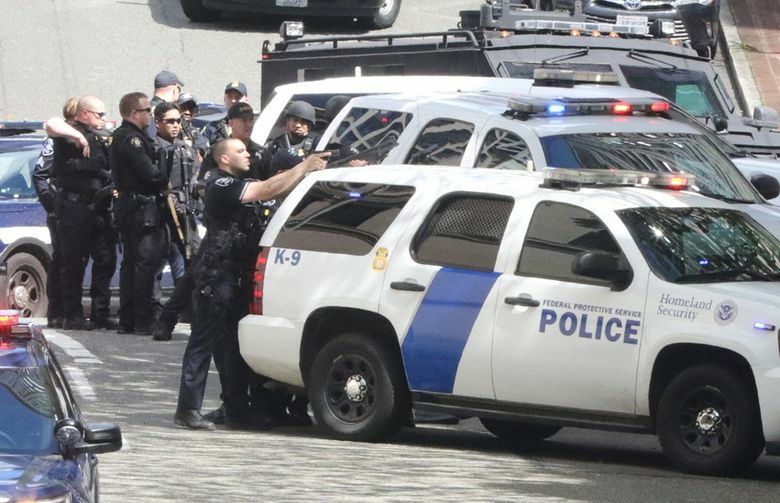 Dozens of police vehicles and officers have blocked off an area outside the Henry M. Jackson Federal Building to investigate. Some officers are wearing tactical gear and carrying rifles. Agents from the Bureau of Alcohol, Tobacco, Firearms and Explosives are at the scene. “This is a dangerous area. You don’t want to be here. 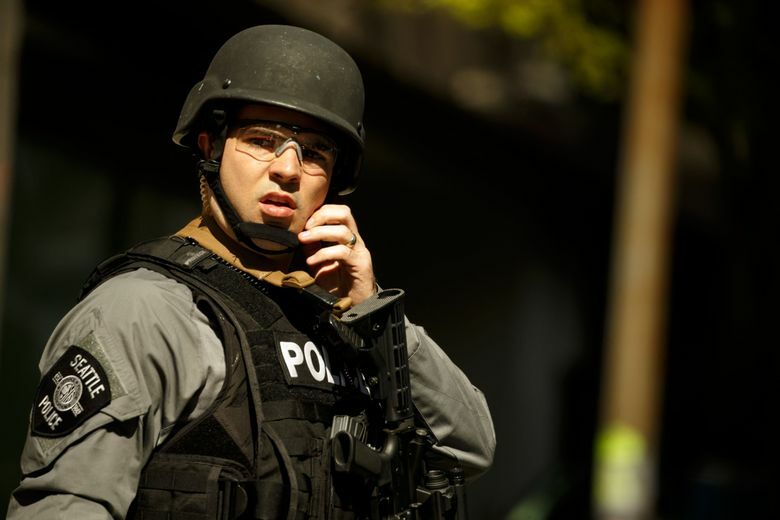 There are guns,” an officer told a reporter near the area. Officers appear to be searching for the shooter. 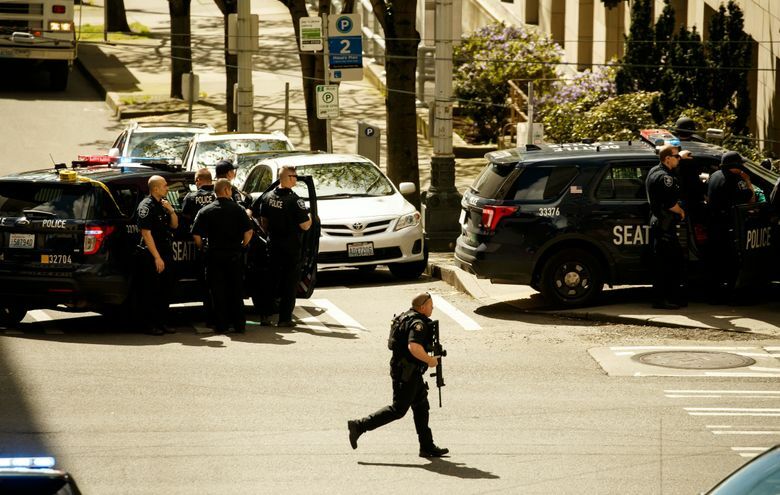 Seattle Times reporters and photographers are heading to the scene. Police ask that people avoid the area as they investigate. 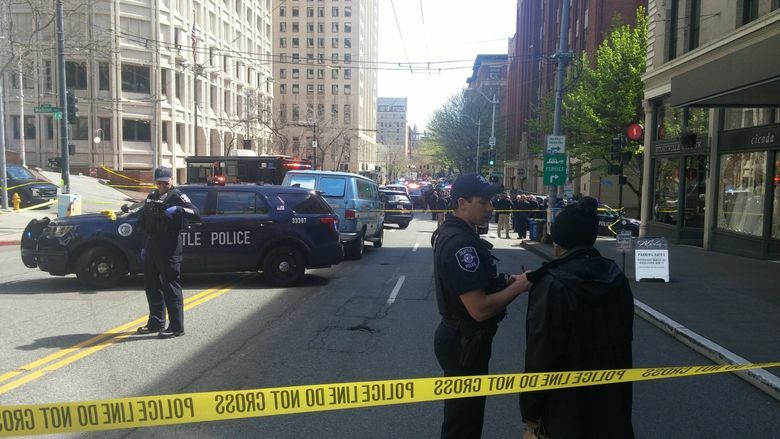 Two officers shot following police response to robbery near Madison/Western Ave. Please stay out of area as we investigate. Details to come.